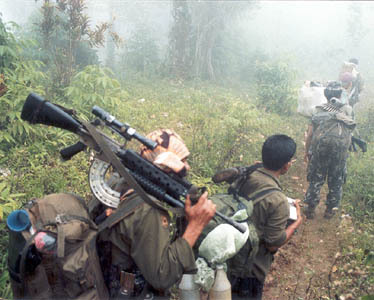 It has been over forty years since the New People’s Army (NPA) was formed. The group, the armed wing of the Communist Party of the Philippines (CPP), was organized to topple the Marcos regime, and has well served its’ purpose. Democracy had been restored. Marcos is long gone. But four decades had passed and the guerrilla group still lives and could recruit at ease. At present, they are the country’s largest illegal armed-group. It’s a mystery as to how they remain popular though. With all the crimes the group is linked to, they remain influential among liberal-minded youths, among rural peasants who have been disappointed by CARP. Among factory workers on minimum wage. Surely it’s not just the negligence of our government to all our country’s problems, all the allegations the president takes on. Getting rid of corruption? That excuse is well overused. According to the NPA, the aim of their revolution is for ‘change’. Change from a multi-party, democratic government to a single party authoritarian one which the Chinese patented as Maoism. Once they have toppled the government, they promise that Maoism will improve their conditions. That the lands that they till will become theirs. That promise has yet to be fulfilled after four decades. And that outcome is doubtful.The NPA guerrillas don’t even act like the freedom fighters they claim to be, they spread terror and fear to anyone who goes against them. Their main source of funding is extortion, targeting companies who could have given employment to Filipinos. They damage, if not destroy, infrastructures that are of great use to the people and to the economy. Aside from China, Maoist governments have failed to improve conditions in their countries. In fact, Maoist reforms have given more problems to their economies; the middle class plunged into poverty, unemployment rose. Their defiance to the international community results into trade embargoes. Improverish nations such as Laos, Nepal and North Korea are examples of the ineffectiveness of a Maoist state. They do promise to bring prosperity, but only after they have caused mass decline first. And if the NPA are really sincere to their promises, they should start applying it to the villages and towns that they already control. But even that, they fail to comply. They extort companies, scaring business and employment away. They blow up bridges that could’ve made the delivery of fresh crops to markets faster and cheaper. They aide other renegade factions such as the Magdalo group, who aren’t even Maoist, just to create a bigger problem to the military. The mere beliefs of Maoism are itself wrong. They link themselves to Communism but their actions aren’t that of communists. Instead of winning support from the people, they force it. For a Maoist government to succeed in the reforms that it promises is very unlikely. Despite this, the plague of Maoism continues to spread throughout the country, brainwashing the most promising of minds into warfare. The change that we need lies in our own hands, and not in Maoism. May peasants, workers and especially scholars realize this. And stop themselves from being exploited by the goons who call themselves the New People’s Army.